I've mentioned tangentially the weekly healing circle on Gaia Rising. Today I am going to take the time and space to focus on the Tuesday evening ritual. The circle is led by Enchantress Sao, who was the primary reason I joined the Anam Turas group, why I stay in the group, and continue to visit Gaia Rising. Enchantress is an open, welcoming, accepting spirit who recreated the earth she loves across four sims. While other flashier locations have dropped off my list, I continue to visit those sims. And I've learned much about compassion while observing E as she welcomes all and sundry avatars. During ritual, simply by varying her intonation she makes the healing ritual other worldly, lifting it to a metaphysical plane. It is the subtext in her voice that makes ordinary words magical. I have experienced her speech as dramatic or emotional, but she can also speak softly and create the same effect. She's my example of an accomplished pagan priestess. The healing ritual is generic pagan, a montage of practices. The quarter elements, spirits, sun, moon, and ancestors are called. Then the name of each person needing healing is read along with a customized healing request. Participants respond in voice or chat. Afterwards, the elementals and gods that were called are released. Dress is informal. You're invited to dance, sing, drum, chant and play an instrument. Or you can sit quietly on a cushion and observe. 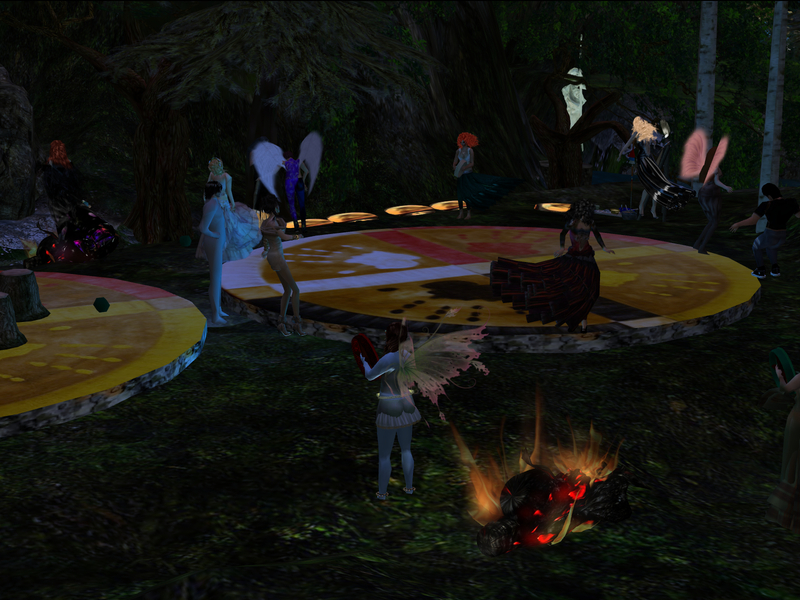 The next circle is tonight at 7 PM SLT. All are welcome. Quite the counterpoint to my blogging piece! Thank you for reminding me of what is going on in Second Life, Elaine. I don't get 'round there too much these days. I guess I'm the only one there, then. Although the vacant property next to my parcel has been rented after a six month vacancy. I do read your other posts but I find it hard to get overly concerned about much. I promise to check out OpenSim and Jokaydia some day. Do My Students Need a 3D Web?